The passing of a close friend or loved one is a difficult and confronting experience to face, but that doesn’t mean you have to endure it alone. At Sahara Funerals, we provide comfort and support for those who need it most, along with a range of Hindu Funerals Sydney Services designed to take the stress out of funeral planning. Our Funeral Directors are experienced in preparing and arranging all kinds of Hindu Funeral Services in Sydney as well as Buddhist Funerals Sydney. No matter what faith or belief you follow, we let you say the final goodbye exactly how you want to. We are experts in Traditional Hindu Funerals in Sydney, always keeping in mind tradition and respect. Being a family-run Hindu Funerals Sydney establishment, we understand the importance of a strong, supportive community to get through tough times. With each service we provide, you can expect a welcoming and inclusive environment every time. In times of desperation, having someone to talk to can make all the difference; that’s why we dedicate ourselves to providing personal support and assistance in any way possible. At Sahara Indian Funerals Services Sydney, we take you through every step of the process; from choosing the appropriate venue for the final ceremony, the place of cremation, viewing of private facilities and more. This allows you to make informed decisions about each component, with professional guidance and assistance to help you along the way. In true spirit of the Hindu faith, we understand the importance of Hindu Cremations in Sydney and their purpose in distinguishing between the soul and physical form. After the passing of a person – the soul, which truly represented the individual – departs from the deceased body, which is then cremated and their ashes collected. 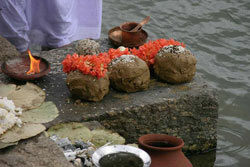 Afterwards, the ashes are dispersed of in a sacred body of water, or another place of important for the departed person. 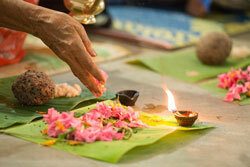 The Hindu faith has many different approaches to the funeral process. Depending on your cultural and regional upbringing, there are many variations to how ceremonies are conducted. Our Hindu Funeral Directors in Sydney has been involved in the arrangement and preparation of many funeral services, which means you can expect a service that’s personally catered towards your needs. Irrespective of your traditional Hindu background, our professional Hindu Funeral Services Sydney can create a personalised experience for all participants involved. 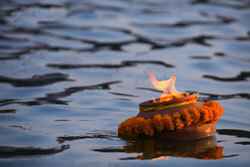 Our Hindu Funeral Services in Sydney don’t just cover the funeral arrangements. During times of emotional hardship, reaching out for assistance from a professional consultant can help bring you comfort and closure. That’s why we provide you with support and advice 24 hours a day, 7 days a week. Simply contact us at any time and your Hindu Funeral Director will be able to assist you in any way possible. The repatriation process involves returning the deceased individual to their home or place of origin. If you wish for the dearly departed to return to their place of birth, whether that be overseas or interstate within Australia; we can make all the transportation arrangements possible. Through proper planning and preparation, your loved one will be transported in a safe and secure environment. During the repatriation process, we take care of all the necessary legal procedures for you. We liaise with the relevant authorities and prepare all the legal documents for you. Once the body has been transferred overseas or interstate, we contact the relevant family members to ensure the process went smoothly. At Sahara Funerals, we are a strong and supportive Hindu Funeral Company in Sydney, with a passion for helping people and taking the stress out of planning Hindu Funerals. Make an enquiry into our services today and call 0422 728 588 or 9676 8338.